I am sure people here recall me mentioning “The Merrimack Event” on this blog on occasion. Maybe not — I only bring it up every third or fourth blog post. Some day in the not-so-distant future (as in, between now and Ravencon), I hope to get this book out there. But it is still in the “needs work” category. The thing is, “The Merrimack Event” is old. It’s actually older than In Treachery Forged (well, sort of; I started The Merrimack Event first, then wrote most of In Treachery Forged, then finished The Merrimack Event, then finished In Treachery Forged). When I decided to turn to self-publishing, I sat back and evaluated everything I’d ever written, seperating it into several categories. There was the stuff that just needed a polish before it was ready (sadly not that much; there was In Treachery Forged, which was the first book in a novel series, and the Rink of War, which was the only “ready” story one out of a much larger collection of novettes, novellas, and short stories taking place in a shared universe, and Voices — a very short story (just barely above “flash fiction” length) which I still need to find a place for), stories that were looking good but weren’t finished yet (the novel now published and entitled The Kitsune Stratagem, plus a few other things which I’m not discussing yet as I still haven’t worked on them since), and a depressingly long list of things I rejected as unpublishable. (Yes, that’s right — as a self-publisher, you have to learn to reject your own manuscripts if they aren’t good enough). Most of the rejections were short stories, barely begun unfinished works, and the like, but there were at least three works which, while not necessarily finished, had already reached full novel length. The first was a historical fiction entitled “The Little Ring-Giver” about a barbarian mercenary hired by Rome to fight against Attila the Hun; it ended tragically (the hero is killed before the end, so his lover disguises herself and plots to marry Attila and murder him on their wedding night). It… well, let’s just say it had a silly plot, overly purple prose, and a poor grasp of the “historical” aspects of historical fiction. The second was a prequel to Oedipus Rex (I may have mentioned this here, before — in High School, I was required to read this play several times; when I was forced to read it one too many times in College, in an act of self defense I decided to do something to make it (a) more interesting and (b) to make sense of Oedipus’ punishment (if it were modern times, I think he could argue the situation the Greek Gods put him in was entrapment of the worst kind). The problem with this one was I couldn’t decide whether it should be prose or script, and wound up with an awful amalgam of both. The third novel-length manuscript of my own I rejected was another historical fiction; a highly improbable bit of Naval combat during the Napoleanic wars. I actually might still write a novel with the same premise of this one, some day, but just about everything else from this book (bad research, bad dialog, purple prose, improbable plot twists,and more) means I’ll have to start over from scratch. The Merrimack Event was the only significant item of a final category, however — things that were “not publishable yet, but still salvageable.” It was in… rough shape, and had a lot of dust on it, but there was a lot of promise in it as well. It had been through three or four revisions already, at the time, and with all of that work into it I was loathe to abandon it entirely. So, after “In Treachery Forged” was released, I dusted the cobwebs off of The Merrimack Event and started to revise it… again. For example, I need to make sure that the engineer doesn’t call touchscreen keyboards a poorly adapted “new” technology (a real example from the book), even though… well, if you’re reading the blog on a Kindle Fire, you’ve probably already got one in your hand. Back when I first wrote that scene, touch screens seemed a lot more impractical (something which might work, but no-one would favor a touch-screen keyboard over a tactile keyboard). Obviously, time has proven that my read on that was wrong, but even though the story has been edited many times since it became clear that touchscreens were here to stay that scene has never been changed to reflect reality. Now, the character discussing it was talking about how his service was being forced to adopt new technologies before the bugs had been worked out, and how he prefered more retro technologies in these cases, but given that this story is supposed to be set hundreds of years in the future one would think that any of the bugs he discussed would have been worked out by then. I’m not alone in having this difficulty. During the 2009 Marscon (a good convention, but that year it was at a horrible hotel; I didn’t go back until they changed hotels), author John Ringo (who really would have a worse time of it than me, considering he was writing “near future” science fiction and The Merrimack Event is more distant-future space opera, so the stuff I can write about can be even more off-the-wall) pointed out that there were one billion engineers and scientists on Earth (note: I don’t know if this number is even close to accurate, but the point stands even if it’s a lot less), and there’s only one of him trying to stay ahead of them all. This is a fixable issue, and will be corrected before the book goes out the door… but the next time you read a science fiction book, and something fairly everyday is discussed as impractical or impossible, remember that technology can advance in unpredictable ways, and unexpectedly fast. 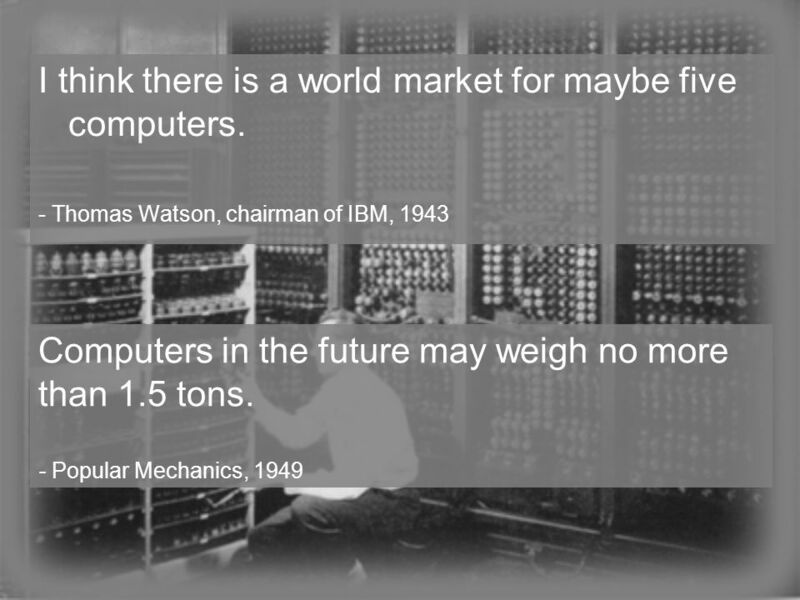 And that the technological prediction might have been made longer ago than you might realize….